This note summarises developments after the June 2017 General Election. Earlier notes in this series are listed here. 'As the old politics of redistribution and mediating between classes have diminished in relative importance, the new politics of competence in public service delivery and in national decision-making have come to dominate: the civil service is central to the capacity of any government to deliver public services. This is a new challenge with which politicians and civil servants are wrestling. The front line is deeply affected by the centre. Despite all of the proposals, the fundamentals of the system have not changed. Indeed, the fundamentals can be defended vigorously, and it is these fundamentals which most need to change. The civil service system has not experienced the sea change which most of the rest of the country, in the public and private domains, has undergone. Our public debate has assumed for decades, if not generations, that the principles of civil service organisation are somehow sacrosanct, and that methods first outlined 150 years ago remain the best way to organise public administration today. " 'End the separate existence of the civil service and its isolation; to make it part of the government of the day; and to start joining it up with the public services it exists for. Give governments and ministers the authority and resources they need to deliver on election commitments. 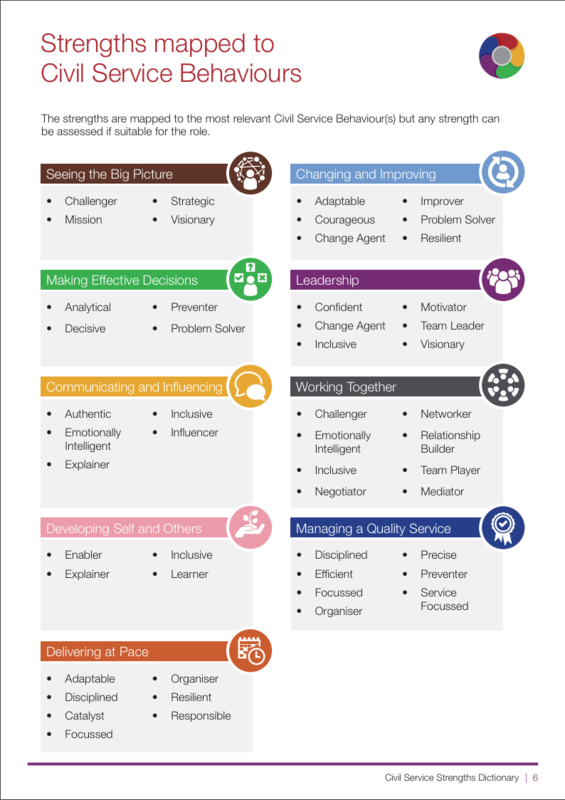 Create clarity of role, and separate the independence-driven roles from the roles of service delivery and of parliamentary, political and legislative management. Adopt and apply organisational best practice with particular impact on the sourcing and motivation of people. Undertake change at quick pace. **Pedantic note:- I don't think that 'the independence imperative' is quite the right phrase. Unless you are a government minister, the civil service looks far from independent from its political masters, not least because of the strictures of the Armstrong Memorandum. But the analysis of the paradox later in that paragraph has real force. Mr Straw correctly noted that 'none of the civil service reforms [since Northcote Trevelyan] have ever addressed change in [his] comprehensive and aligned way' and concluded that 'Tackling the issue will take skill and courage.' I am less convinced by his assertion that reform 'is a day one issue, in that the longer a new government is in office the more it gets stuck with the status quo and cannot break free. Day one is the first day after the election of a new prime minister or of a new party in power.' My own view is that progress can only be made on a cross-party basis - not least because of the short-term politics identified by the author. A more detailed analysis of the repeated failure of attempts to reform the civil service may be found in my webpage discussing Civil Service Reform Syndrome. If the UK Government is to succeed in negotiating the complex challenges that it now faces, the civil service must have the specialist capability that it needs. Over the past four years, the leadership of the civil service has stepped up efforts to professionalise key activities such as policymaking, financial management and commercial procurement and contract management. Professionalising Whitehall takes stock of the reform efforts under way in eight core cross-departmental specialisms ... and ... offers an assessment of where these specialisms are at now, and argues for four priorities for reform. One recommendation was that civil service leaders must tackle the “entrenched perception” that Whitehall policy roles are the best way to reach senior posts. In particular, the leaders of each profession needed to ensure that civil servants gained greater access to training and mentoring on how to operate within a political environment and influence policy. This would help specialists progress to senior management positions within departments and make a career in specialisms outside policy more attractive. There was a particular problem in that she had appointed one of her favourites, Ollie Robbins, simultaneously to report to her and, as his Permanent Secretary, to Brexit secretary David Davis. The latter inevitably fell out so Mr Robbins was moved into No.10 Downing Street in September 2017.
homeless claimants unable to get help with the full costs of emergency temporary accommodation. third parties facing difficulties resolving claimants’ problems due to the DWP’s insistence that the claimant must give explicit consent for an adviser to act on their behalf." 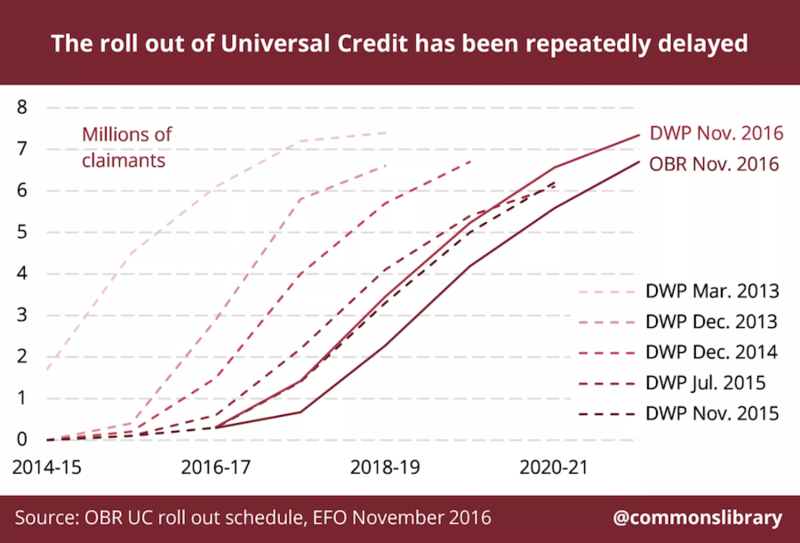 Some argued that Universal Credit (and possibly also Brexit) were good policies, badly implemented. But Chris Dillow disagreed and argued that implementation is policy. "A failure of implementation is ... often a sign that the detail hasn’t been thought through, which means the policy itself is badly conceived. Reality is complex, messy and hard to control or change. Failing to see this is not simply a matter of not grasping detail; it is to fundamentally misunderstand the world. If you are surprised that pigs don’t fly, it’s because you had mistaken ideas about the nature of pigs. ... Bad implementation is at least sometimes a big clue that the policy was itself bad." Either way, one is forced wonder whether the civil service good have done more to help or persuade Ministers to improve the design of the policy and/or its implementation. It is though fair to point out that Ministers' principal objective for the Universal Credit appears to have been 'to make work pay', rather forgetting the rather more fundamental objective of providing social security for the unemployed and those who cannot work. This suggests that Chris Dillow's thesis holds true and that it was the conflicting policy objectives that eventually created the largest implementation obstacles. John Major made an interesting speech The Responsibilities of Democracy late in 2017 in which expressed concern about the way in which the civil service had been "undermined by its own masters". "It is in our national interest that public service should remain a career that attracts some of the very best brains in our country. We should value it, not disparage it." "Why Whitehall is Struggling with Brexit"
Former Chancellor Lord (Nigel) Lawson attracted some attention in January 2018 when he told the BBC that civil servants would "do their best to frustrate [the Brexit] process because it goes against the grain so fundamentally ... Brexit is a most radical change of direction for this country. The idea that any bureaucrat could be in favour of radical change is a nonsense. Bureaucrats by their very nature loathe radical change of any kind." "... officials equally realise their constitutional duty to accept the leadership of the politicians, of the elected government. ... I was... a member of the Thatcher government. We came in and introduced radical change in economic policy. All the officials were aghast. They thought it would be a disaster. But at that time we had a strong cabinet led by an outstanding prime minister and they accepted the political leadership as is their constitutional duty. So we made this radical change and it worked out very well. It is really the job of the government, the cabinet and above all the prime minister to force this through." Lord Lawson, the former Conservative chancellor of the exchequer, recently launched a broadside against the UK civil service over Brexit. ... Reading today's annual report on the state of Whitehall from the Institute for Government, one could be forgiven for taking a different view. Civil servants seem to be doing their best to implement an orderly Brexit. The trouble is that political decisions by ministers are making the process much harder. Three points from the IFG report illustrate this. The first concerns the degree to which Theresa May has reshuffled her ministerial team since coming to power in July 2016. True, the top level cabinet posts have barely changed, as Mrs May tries to maintain a balance between Leavers and Remainers in her entourage. But according to the IFG, some 85 of the 122 ministers across government (71 per cent) are new in post since last year’s general election. Given that most departments are heavily affected by Brexit, this seems a remarkable — and unhelpful — amount of ministerial churn. It has been especially acute at the Department for Exiting the EU where, for example, the minister in charge of managing Brexit through the Lords has now changed three times. The risk is that change on this scale favours short-termism over depth of knowledge. The third point regards the number of projects Whitehall is undertaking overall. Given that Brexit is such an immense task, one might have assumed that ministers would ease up on some of the other things the civil service is doing. But they are not. The Infrastructure and Projects Authority oversaw 143 government major projects in 2017. That is the same number as it did in 2016. John Manzoni, the chief executive of the civil service, said in 2016 that Whitehall is doing “30 per cent too much to do it well”. But ministers don’t appear to be listening. As a result, according to the IFG, the government is now confident of successfully delivering just one-in-five projects. Brexit is the biggest challenge facing Whitehall since 1945. The impression from the IFG report is of a civil service that is struggling to cope under the pressure. The Brexit legislative programme is behind schedule; departments are being less and less open about what they do; major projects, even if unrelated to Brexit, are more and more at risk. Pace Lord Lawson, these problems have not been generated by civil servants. Much of the difficulty is down to decisions taken by politicians — often from Number 10 itself. 'In 2013 the UC programme was on the brink of complete failure. It is to the Department’s credit that it has brought it back from that brink. Though it has been subject to extensive delays, the programme is now run more professionally and efficiently with a collective sense of purpose. It continues, however, to face major challenges. Chief among these is automating the service. While the Independent Project Authority's (IPA’s) call for the “industrialisation” of UC for complex cases and vulnerable customers is an unfortunate choice of phrase, UC can only deliver its promised efficiency gains if it becomes cheaper and less labour-intensive. The Department has consistently struggled to convince the IPA that UC can scale as planned. The Department must balance the considerable costs of further delays against the costs of pressing ahead. The “firebreak” in the rollout in January 2018 and the full business case, which was due in September 2017 and is [not] now expected to be considered by the Treasury in March 2018, are important points of reflection. When it chooses to proceed with further major steps in the programme the Department should do so having met clear performance criteria agreed in advance. Their failure to do so up to now is a refrain through the IPA’s reports. So too is criticism that UC would have benefitted from better engagement with local authorities. They are critical to the success of UC. The Government’s approach to major programme assurance is flexible. The IPA agrees with the programme team a distinct timetable and scope for each review. This meant that some important findings on UC were not followed up in detail. Notably, the latest review, which considered the readiness of the digital service for accelerated rollout in late 2017, was explicitly excluded from considering whether previous IPA recommendations had been acted on, whether UC would achieve its business case, and whether it was delivering its policy intent. We were also very surprised that such a major programme has not been subject to the scrutiny of a Programme Assurance Review (PAR) for over two crucial years of its development. In the eighth year of the programme, a full business case for UC has yet to be submitted. There remains considerable uncertainty about its costs and benefits, not least in its employment impact for claimants other than those in the simplest circumstances. Scrutiny of the programme would benefit from a more transparent approach by the Department. Given its confidence that the programme is on track, the DWP should also benefit from greater openness. And the Office of Budget Responsibility said that 'We conclude that the move to UC is: fiscally significant and complicated to assess; has large, but largely offsetting, effects on spending; involves large gains and losses for some groups; and poses a risk to public spending control due to information gaps'. Professor Kakabadse's evidence prepared for the Public Administration and Constitutional Affairs Committee was delivered in March 2018. 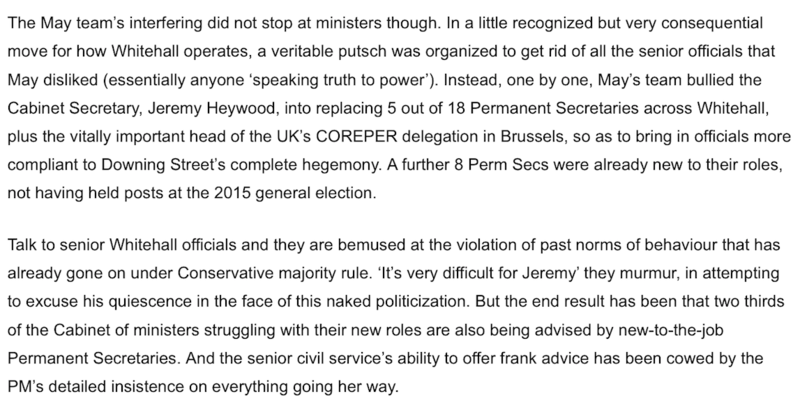 Its central (and unsurprising) conclusion was that the personal 'chemistry' between Secretary of State and Permanent Secretary powerfully determines the effectiveness of policy delivery. But it was a well evidenced report and so well worth reading for its fascinating detail. I comment in more detail in the 'Speaking Truth to Power' area of this website. The significance of the minister-official relationship, and the tensions that can arise within it, have long been recognised. Efforts to address this tension, such as the 2012 Civil Service Reform Plan, have tended to focus most on how to make the Civil Service more responsive and more accountable to the ministers they serve. There is much less discussion about the part ministers should play in making minister-official relationships work better. Effective planning and prioritisation depends on the strength of the relationship between ministers and their officials. Ministers must be confident that the Civil Service can deliver policies on time and to budget. But officials need to be able to talk to their minister about resource constraints and about realistic timeframes for delivery. Too often, such realism is regarded as resistance or, because the trust is not there, officials feel the conversation is avoided altogether. The need for such honesty and openness about priorities is all the more acute since government has taken on the additional tasks arising from exiting the EU. Single Departmental Plans should be at the heart of these discussions. They have not so far delivered the promised link between the allocation of resources and delivery of priorities. ... the most senior officials often lack the subject expertise and depth of experience in the department which their ministers are entitled to expect. The 1968 Fulton Committee lamented what it called the “cult of the generalist”, but the problem has become more serious. It is now widely accepted that the closure of the National School for Government has left a gap in [civil servants] learning and development that subsequent provision has failed to fill. Some steps to address this, such as the Civil Service Leadership Academy and the Centre for Public Service Leadership, have been taken. But these and other new institutions will not provide the crucial anchoring role for the Civil Service that the National School for Government did. We intend to look at the possible creation of a new overall body to nurture future talent and leadership in a follow-on inquiry. The Civil Service needs its own institution, where Civil Service thinkers, educators and leaders have the space to reflect on how the Civil Service should be more mindful of itself, its challenges and its future, and which can transmit the values, attitudes and positive behaviours vital to the future strength of the Civil Service from generation to generation. He also talked about the way the civil service had responded to the challenge of Brexit. I recommend this former civil servant's perceptive discussion of the capability of the civil service as of late 2017. There is too much saying "We are going to deal with this by setting up a new performance indicator" and "We're going to deduct some money if you don't reach your KPI", rather than spending time on the ground and saying "This is disgusting. Sort it out!". John Manzoni launched these in the summer of 2018. An introductory/overview document is here, and there were also detailed descriptions of desired civil service strengths and behaviours. Follow this link to read some sensible advice on leading and managing policy teams. The Windrush scandal that enveloped the Home Office in 2018 drew attention to numerous problems within the department following the introduction of the 'hostile environment' for immigrants - whether or not they had lived in the UK since childhood many decades ago. The austerity-driven downgrading of immigration casework from Executive to Administrative Officers did not help as AOs were not allowed to make significant decisions on their own. "We lost face-to-face interviewing and went to a paper based system." "When you're dealing with thousands of applications, you're not seeing the people, you're seeing the files." Subsequent developments in civil service reform are summarised in the next note in this series.